“Conflicts around the world are giving rise to new threats and emergencies; illegal migration, spread of terrorism and violent extremism, social disharmony and even the threat of nuclear war,” she said, according to both an official transcript of the speech made available to the media on the same day, and a live broadcast of the event on Myanmar Radio and Television’s Facebook page. The official transcript of Daw Aung San Suu Kyi’s speech at the 13th ASEM Foreign Ministers Meeting. The part misquoted by the AP is highlighted in blue. But in its report on the speech, AP’s paraphrasing of Daw Aung San Suu Kyi’s comments badly distorts the meaning of her actual words. 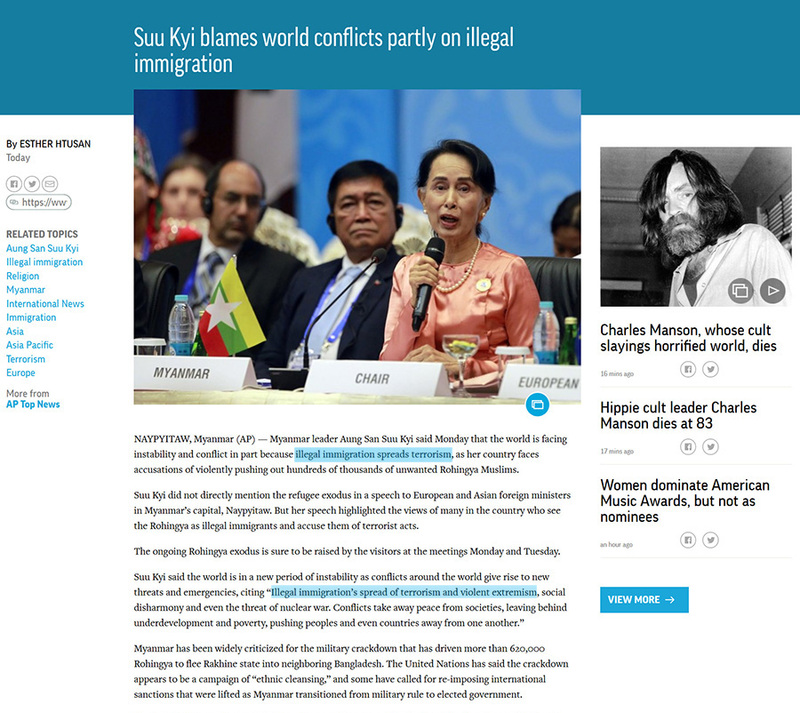 The AP story misquoting Daw Aung San Suu Kyi. Misquotes are highlighted in blue. 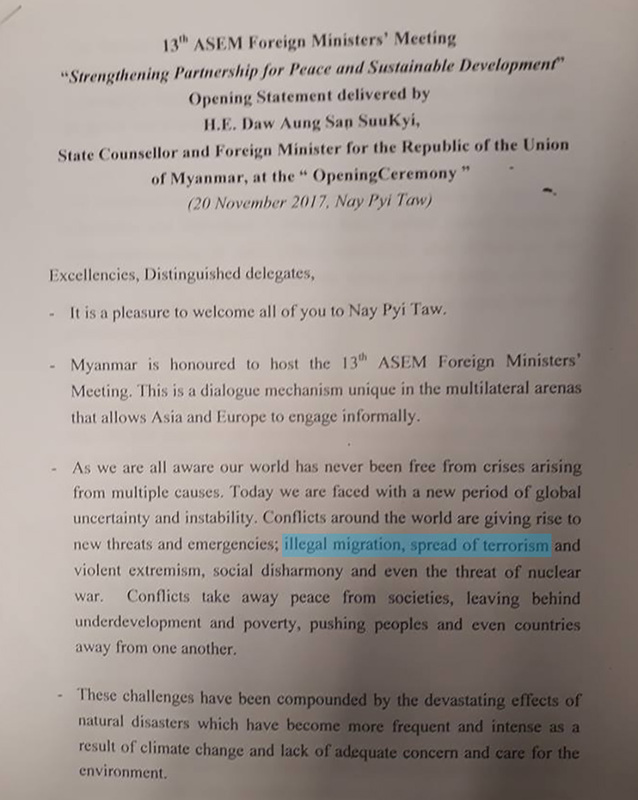 To set the record straight, here is an explanation: Daw Aung San Suu Kyi didn’t blame “illegal immigration” for the “spread of terrorism” in her speech. “Illegal immigration” and “spread of terrorism and violent extremism” are mentioned as discrete problems, not linked by cause and effect. Even listening to the speech, there are audible pauses between the two phrases. This is even clearer in the written transcript, in which “illegal immigration, spread of terrorism and violent extremism, social disharmony” are explicitly separated by commas. U Aung Hla Tun, vice chairman of the Myanmar Press Council, told The Irrawaddy that the AP’s account is clearly at odds with Daw Aung San Suu Kyi’s actual words. “It must be a purposeful ‘misinterpretation’ with an ulterior motive to hurt her image, and that of our country among the international country,” said the seasoned journalist who worked for Reuters for more than two decades. AP’s account of the speech rapidly went viral, being picked up by more than 20 international media outlets including The New York Times, The Washington Post and Time, all of whom republished the story. It was widely shared on social media as well. The AP story republished in newspapers. U Aung Hla Tun said the AP should have stuck to Daw Aung San Suu Kyi’s original speech, as this is a fundamental tenet of professional ethics for journalists. “AP must correct it as soon as possible and make a public apology to her and our country too,” the council vice chairman said. The story ran uncorrected until late afternoon on Tuesday Myanmar time and the AP did not respond to requests for comment. 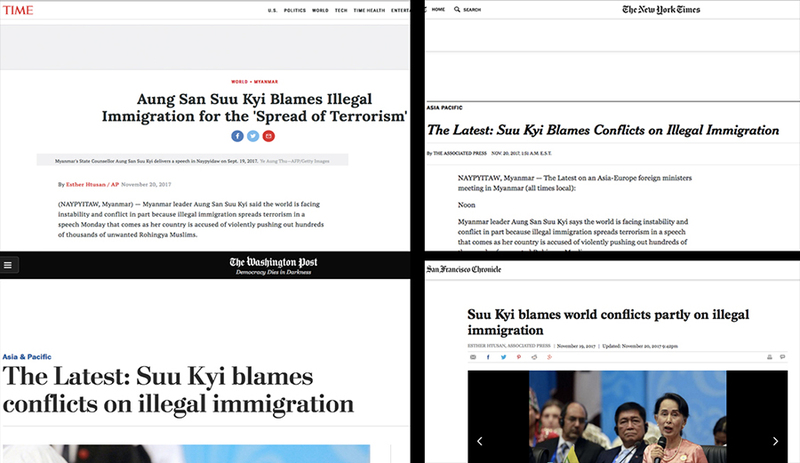 U Aung Hla Tun said this was just the tip of the iceberg when it came to biased reporting by international media about sensitive issues like the Rohingya in Myanmar. He accused the international media of sensationalizing and misinterpreting the issue. Discussing the international media coverage of the Rakhine issue, Bertil Lintner, a longtime observer of Myanmar, told The Irrawaddy weeks ago that Aung San Suu Kyi-bashing had become the name of the game in the international media these days. In September, Al Jazeera, Channel News Asia and Reuters also published inaccurate information and misleading pictures on the Rohingya issue. Only CNA corrected its reporting.